ELK Fantasy Lady is the daughter of Double "O" Good Herdsire Hall of Fame male, ELK Hercules. Like her father she has his regal presence and stature. She has excellent conformation and bite. Her dense fiber has consistent, uniform crimp bundles throughout. If you are looking for a solid foundation female, look no further. Soft Shinook is a large (i.e., LARGE) beige boy out of White Zephyr I (Royal Fawn son) and Soft Sable (HDF Accoyo Lincoln daughter). He has a large fawn spot on his face, and a smaller dark fawn spot near the ears. He does have a white face. Nook boasts Royal Fawn, Pperuvian Leon, El Moustachio, HDF Accoyo Lincoln, and Peruvian Botin. Sydney is sired by ELK Titan Clash's American Bounty, a son of renowned MFI Peruvian Titan's Clash. She is a gorgeous light fawn and her fleece has a buttery, soft handle, with consistent and tight crimp style. Her fleece is on the shorter side (lacking length) and it loses character towards the shoulder and hips. She does, however, have a personality unlike any other! (No kidding there). 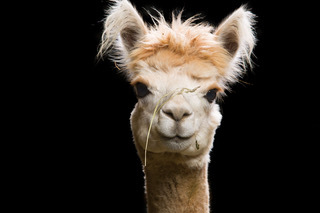 Sydney was shown at 2015 American Alpaca Showcase. 2nd in a class of 3 "light" 2 year old females. Sydney lacked in fineness and substance of bone, compared to 1st place, but had nicer and more consistent fleece characteristics, but not enough to overcome the lack of fineness. 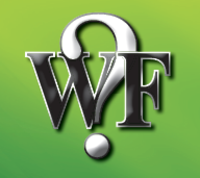 At 2016 WisAFF, 3rd out of 3, again lacked fineness compared to the others and substance of bone. 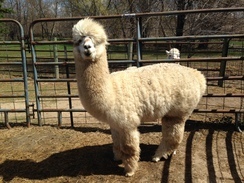 Sydney has been bred to Soft Shinook (beige grandson of Royal Fawn) for 2019. 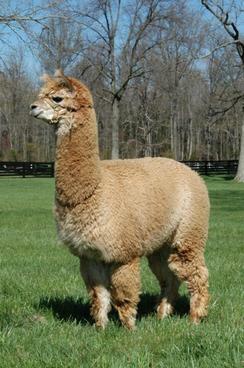 Shinook's 2018 cria out of Sydney's dam (Fantasy Lady) is a beauty. Spit checked on 2/15 and all looks good.